May is Better Hearing and Speech Month known to us as Speech Therapy Month! Speech language pathologists, or speech therapists, work within the full range of communication to evaluate and diagnose speech, language, cognitive-communication, and swallowing disorders and treat such disorders in individuals of all ages. You can read more about speech therapy HERE. 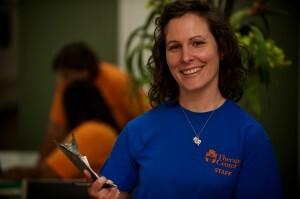 Alyce Benoit is a speech therapist and has been working with Therapy Center for several years. Take a few minutes to read all about her and the reason why she became a speech therapist. Where are you from? I was born and raised in Lafayette LA. Where did you receive your education? I graduated high school in 1999 from Teurlings Catholic. I received my bachelors degree in Special Education and my masters degree in Speech Language Pathology both from UL Lafayette. Why did you choose to study to work in the therapy industry? I always thought I would be a teacher because I love children. I took some courses in communicative disorders and fell in love with the field. I love to talk so figured speech therapy would be a perfect fit for me and it has been. I also had speech therapy as a child and remember pretending to be my speech therapist doing my drills to my dolls. What is the most rewarding part of your job? The most rewarding part of my job is having a patient on PEG tube who is unable to eat or drink and progressing them to be able to safely swallow to enjoy their favorite foods and drinks again. It is also rewarding to help a person after an acute CVA with speech deficits who can not express there wants and needs and progressing them to be able to communicate with their loved ones. It is a wonderful feeling having a patient admitted to a nursing home with a decline in cognitive functioning unable to complete activities of daily living and progressing them to return home. What is the best thing about working for Therapy Center? My great team of therapists at River Oaks Oaks Retirement Manor. I love working for TTC because the owners are very caring and hard working and allow for me to balance work and family. Do you have any hobbies or any activities you enjoy doing most in your spare time? What spare time?! I dont have much spare time because I am always chasing around my 4 year old little boy, Hudson, and 2 year old little girl, Bella. I am an avid UL fan and spend time at many games.